After closer inspection, it looks like you choose your pizza to make the bottom layer, some chicken for the middle, and finish you meal with a salad- the star at the top of the ‘tree’. 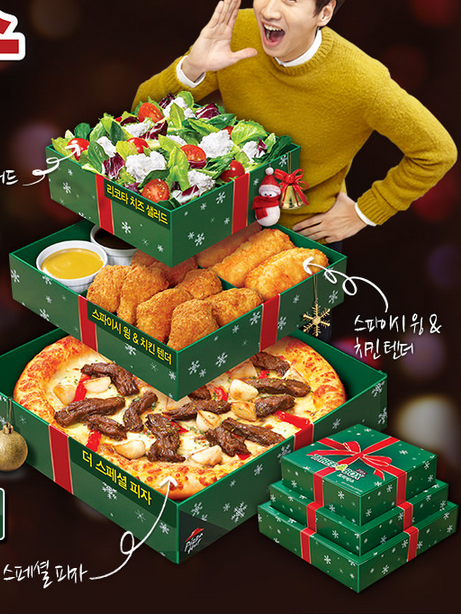 I’ve spoken before about the creativity of pizza in Korea- cranberry crusts, cheesecake crusts, heart-shape designs, to name a few inventive ideas- and this Christmas-edition from Pizza Hut just confirms that Korea is the country for weird, wacky, and wonderful pizza. Will I get a Christmas-Tree Box Delivery on Christmas Day? Who knows… But I do know that Pizza Hut have invented a Christmas Tree far more delicious than I’ve ever seen before.